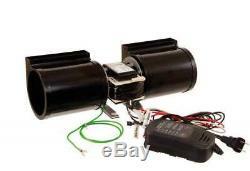 GFK-160B Time Controlled 180 CFM Fireplace Blower Fan Kit with Hi/MH/ML/Lo/OFF Speed Control. The FK-180-ESC is a temperature controlled fireplace blower fan kit that is designed to circulate warm air through many hearth products in the industry, and provide variable speed control with a digital control box. Specifically, this is an exact replacement for the Heatilator GFK-160B fan kit. This unit operates on 120VAC, 60 Hz power, and increases the amount of air the fan will circulate through your room from the gas appliance. The increase in circulation will get up to 180 CFM (cubic feet per minute) and allow the room temperature to heat quicker, as well as maintain a consistent temperature - which also improves the energy efficiency of your appliance, saving you on energy costs. The blower fan will automatically turn on a few minutes after the gas heating appliance is ignited and off a few minutes after the appliance has been turned off. Fireplace fan/blower kit with digital controls. Exact replacement for GFK-160B fan kit; suitable for many products in the hearth industry. Blower features 180 CFM (cubic feet per minute), timer for automatic control, magnetic mounting strips for noiseless operation. Includes: entire blower kit, electronic speed control, power adapter, & necessary wires. Item(s) must be in new condition, with all original accessories and in the original packaging. We are happy to assist you! The item "Skytech GFK-160B Time Controlled 180 CFM Fireplace Blower Fan Kit with Hi/MH/ML/" is in sale since Wednesday, November 8, 2017. This item is in the category "Home & Garden\Home Improvement\Heating, Cooling & Air\Fireplaces & Stoves\Replacement Parts". The seller is "spotixinc" and is located in North Liberty, Iowa. This item can be shipped to United States.